"Great to Use Along with Your Cane for the Blind"
Hi-tech mobility for the blind and visually impaired Ray was designed to provide a handheld, lightweight and compact supplement to traditional canes for the blind. It is a small, extremely sensitive electronic mobility aid that senses obstacles and alerts the user by emitting audible or vibrating signals (or both.) 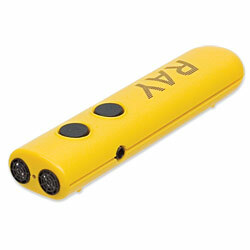 Ray features easy 2-button operation and is so compact that it can fit in the palm of your hand. Using an ultrasonic emission similar to the cone of light of a flashlight, Ray can recognize obstacles up to a distance of 9.35 feet (2.85 meters) away and announce them to the user via an audible or vibrating signal. IMPORTANT NOTE: Ray is intended as a complement to traditional canes for the blind, not as a replacement. While Ray recognizes obstacles in your path, it cannot detect drop-offs such as curbs. Ray is incredibly compact (4.72 long by 1.1 wide and only 3/4 thick) and ultra lightweight at only 2.1 oz. It fits easily in your hand when in use, and slides into almost any pocket for fast storage. Or wear it around your neck using the included lanyard so it's always at your fingertips when you need it.